Moving away from bottles and toward cans will open up new markets for craft beer. More on exactly how that will happen momentarily. First, the explanation. I was over at Belmont Station one day a while ago. It's always fun listening to what shoppers are talking about. One guy was telling his buddy he wouldn't buy a particular beer because it came in a can. This wasn't Rainier or Pabst, by the way. This was a craft beer...Caldera or 21st Amendment, I think. The anti-canned beer opinion is uninformed. 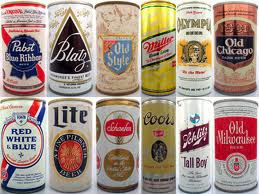 We aren't living in the bad old days when people thought crap beer tasted the way it did because of the can. That beer tasted like crap because that's what it was. Budweiser may have tasted slightly better in a bottle, but it was still crap. The thing is, cans are convenient. They don't break when dropped or jostled around. Cans are light.You can take canned beer hiking, fishing, skiing or golfing. Convenience is a big consideration, sometimes the most important or only consideration. Yet bottles maintained a clear edge in the craft market. Many brewers assumed bottled product was the only thing that would sell. For years, that's the only way you could find craft beer on retail shelves. The bottle bias is starting to breakdown. Bottles are, quite frankly, inconvenient. They break, they're heavy and they cost a lot to ship. Bottled beer takes a long time to chill. Beer in a bottle is also susceptible to light damage. Some craft brewers are turning the corner and moving away from the bottle bias and in the direction of cans. The This change is opening up new markets previously owned by the crap macros. You can get good beer in a can while you're golfing these days. You can get it and take it hiking or fishing. You can get a good canned beer at some sporting events, venues that can't sell bottles for safety reasons. Beyond the convenience offered by cans, there are environmental benefits to consider, as well. Aluminum is the most recycled form of packaging worldwide. About 44 percent of an average aluminum can comes from recycled material. Obviously, cans are lighter and less costly to ship. Breakage is a non-issue. Less energy is used in the aluminum can loop than with glass. Besides the bottle bias, another reason cans have been somewhat slow to catch on is initial cost. A small brewery can fill and distribute 22 oz. bottles fairly cheaply. 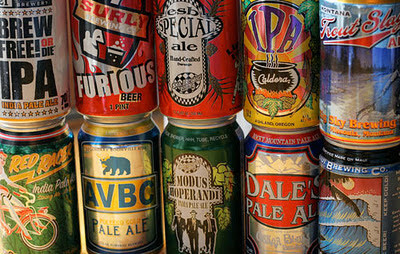 Cans are another story, involving a large upfront investment. That's changing. We've all heard about mobile bottling. Now there's mobile canning. Instead of spending several hundred thousand bucks on a canning line, small breweries can now spend between a few hundred and a few thousand dollars to get started canning, depending on the amount of beer to can and other factors. The future of canned craft beer is now. Contrary to what some may think, it's a good thing.